My family loves cereal for more than just breakfast. Their favorite cereals usually involve chocolate or peanut butter or a combination of both and Pebbles cereals are always a top choice when we stock up on cereal. 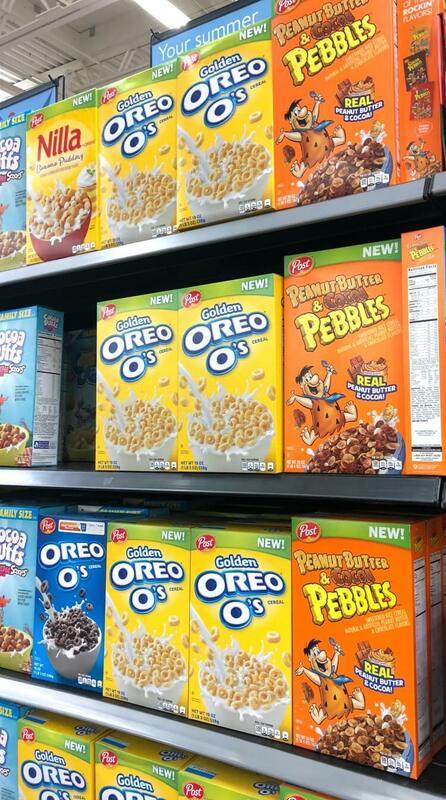 When we saw that there was a new cereal flavors at Walmart from Post — Peanut Butter & Cocoa PEBBLES™ Cereal — we had to get a box. I love saving money any way I can. Right now you can use ibotta and earn cash back when you purchase the new Peanut Butter & Cocoa Pebbles cereal. 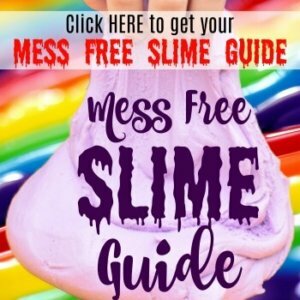 Click the image up above to sign up and get it. My kids and I tried the new Peanut Butter & Cocoa Pebbles and loved it. It’s a delicious crispy rice cereal with the irresistible tastes of real peanut butter and real cocoa. If you enjoy peanut butter and chocolate together, then you’ll love this cereal. 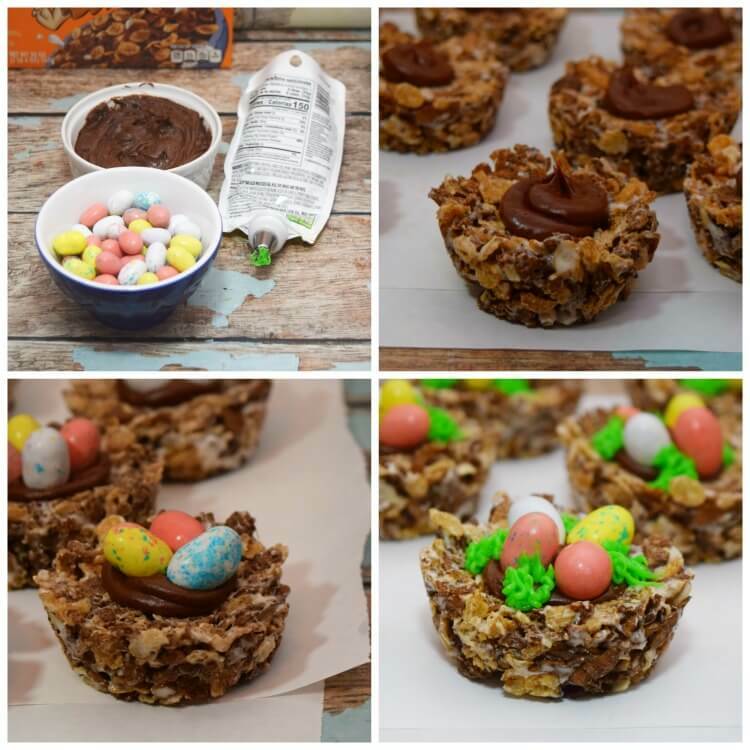 I like to surprise my kids with fun little dessert treats made from breakfast cereals because they don’t take much time at all. 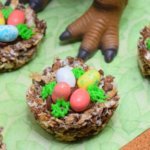 My middle daughter loves dinosaurs, so I knew this was the perfect cereal to make some dinosaur egg nests. They are so easy and fun to make and perfect for a party or anytime. I can’t wait to show you how to make them. First, you’ll make them like you make marshmallow cereal treats. Melt the butter, then add the marshmallows, and melt them. Then, add in the cereal and coat it with the melted marshmallows. There is only one size of the Peanut Butter & Cocoa Pebbles cereal, so I recommend using the entire box of the cereal along with a 16 oz bag of mini marshmallows. This will get you about 2 dozen or so Dinosaur Egg Nests. Once you’ve mixed it all up, then it’s time to make your dinosaur nests. I found a regular muffin tin works perfectly. Just make sure to spray it with olive oil spray before adding the cereal nests. It makes them so much easier to remove when you’re ready to decorate. I used a large ice cream scoop to scoop up the perfect amount of cereal mixture to add to each muffin tin. Then, I sprayed a spoon with olive oil spray and used it to push down each nest. I didn’t have any problem with the cereal sticking to the spoon with the non-stick spray. 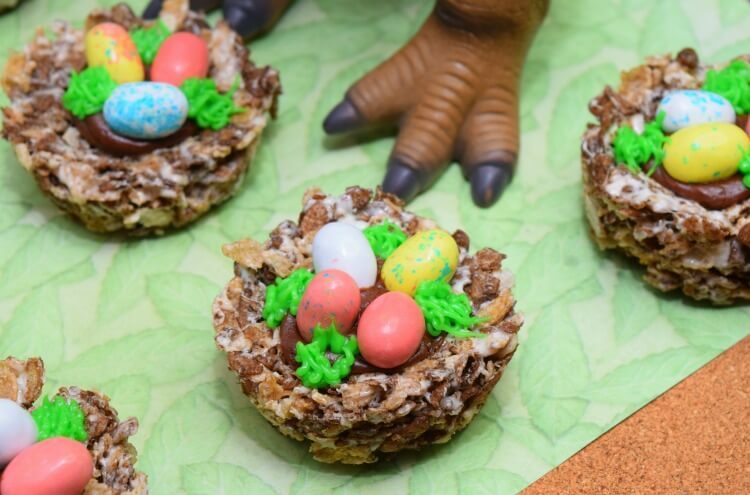 Next, I used dinosaur egg candies, chocolate fudge frosting and green frosting, and created little Dinosaur Egg Nests. 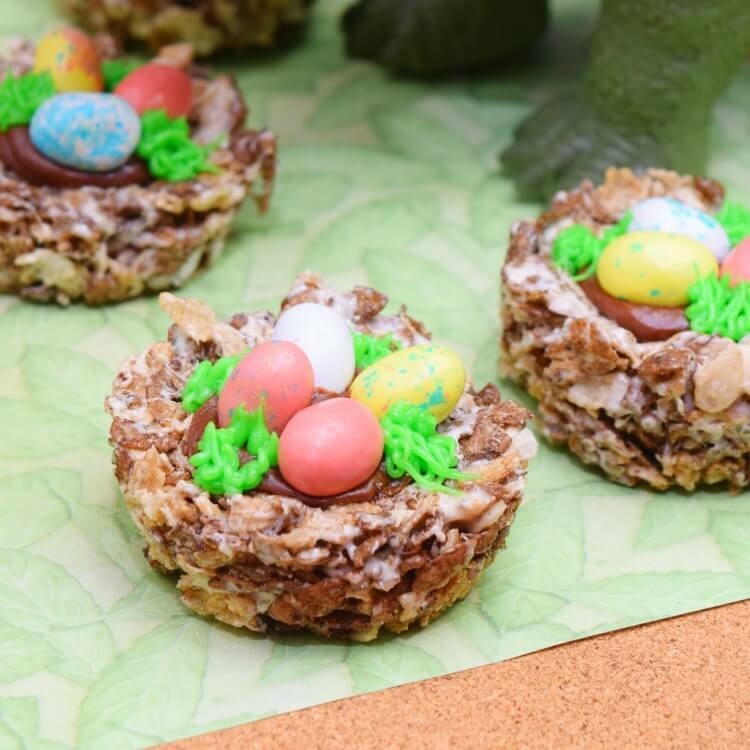 These Dinosaur Egg Nests are easy to make and taste delicious with the new Peanut Butter & Cocoa Pebbles cereal. In a large microwave-safe bowl, melt 3 tablespoons of butter. Add the entire bag of marshmallows and stir to combine with the butter. Melt the marshmallows in 30 second increments in the microwave. Stir at every 30 seconds. 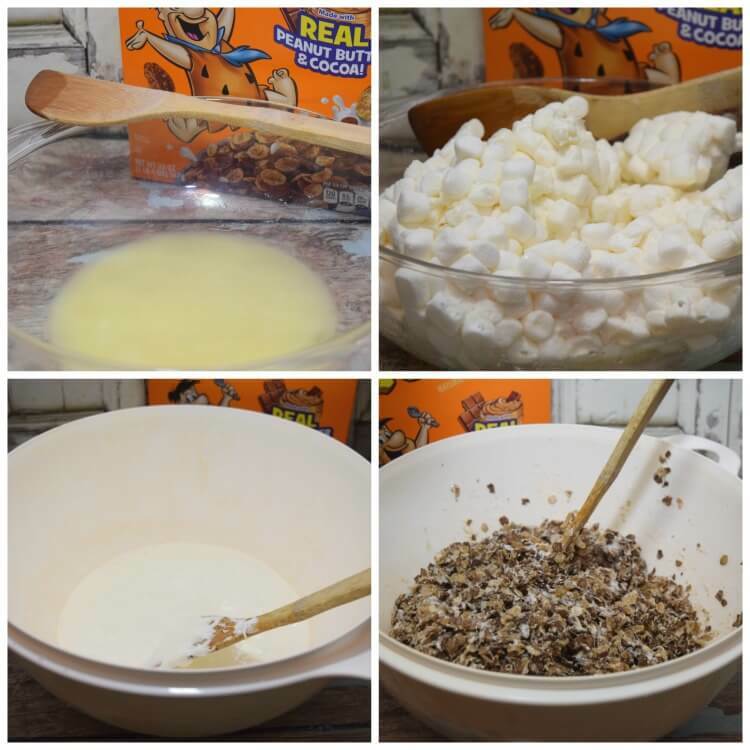 Pour the entire box of Peanut Butter & Cocoa Pebbles into the marshmallow mixture. Stir the cereal up in the marshmallows until it is completely coated in marshmallows. Take 2 muffin tins and spray each muffin part with non-stick/olive oil spray. 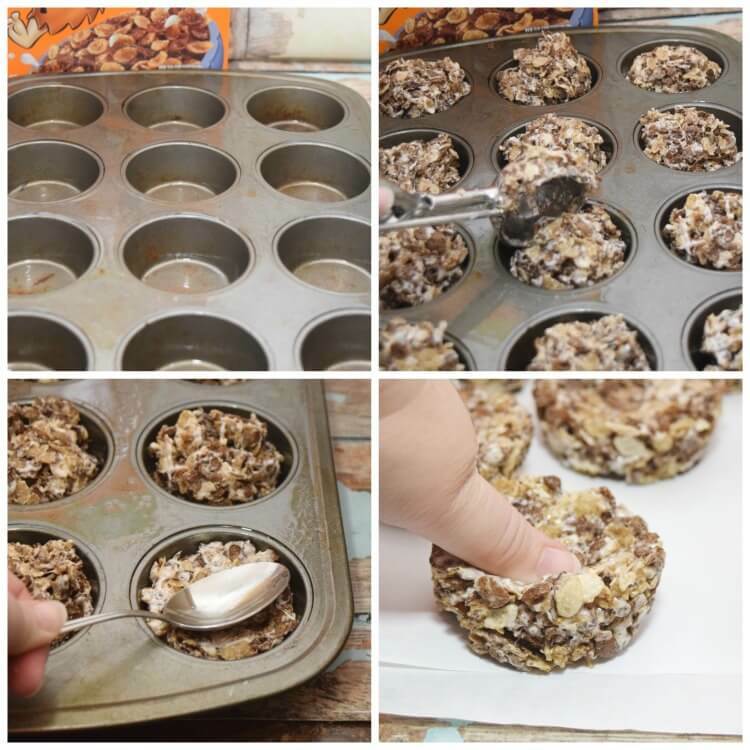 Using a large ice cream scoop, add a ball of cereal mixture to each muffin tin. Allow the nests to cool for 5-10 minutes, so the marshmallows will be less gooey. Pop each nest out of the muffin tin and place on wax paper. Use your thumb to press down in the center of each nest to make an indentation for adding the frosting and eggs. Take the chocolate fudge frosting and transfer it to a plastic zipper baggie. Cut one corner off and twist the baggie down to make it like a frosting bag. Pipe a small circle of chocolate fudge frosting on the indentation. Add 3-5 eggs on the chocolate frosting. Put a grass tip on the green tube of frosting and pipe 3-4 small sections of grass on around the eggs. Oh my gosh, these look so fun! I bet they taste awesome too. I never knew there were peanut butter and chocolate cocoa pebbles . . . my hubby would love those and he doesn’t even like cereal haha! These are the cutest things ever! I think these would be perfect for any dinosaur loving child’s party or even as a fun twist on Easter gifts. Love it! A very original idea! 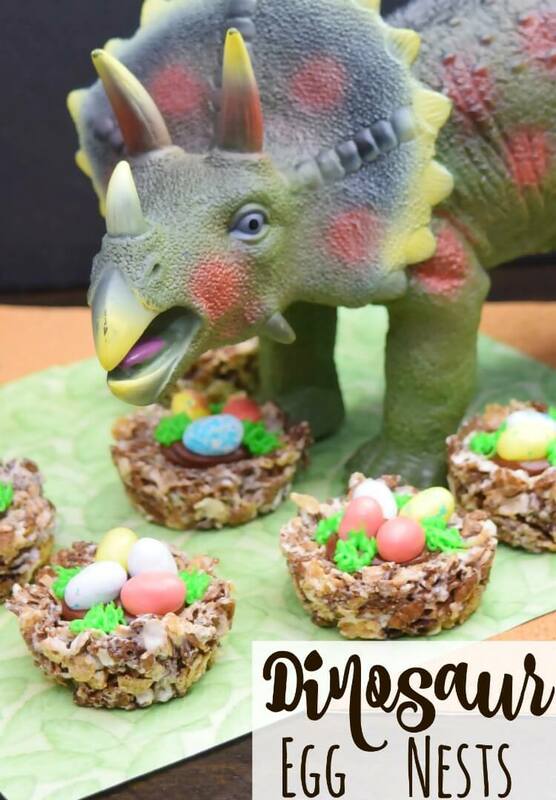 We are planning a dinosaur themed family fun night and just may use this recipe. Thanks for the suggestion! These are so cute! I’m going to make them with my youngest! Oh my goodness, these are so cute! My son would love not only to make these and eat..but probably play with at the table with his dinos lol. So creative! Bookmarking to plan a fun date with my boy! Super fun, Stephanie! My kids would have a blast making and eating these. These are such a cute idea! 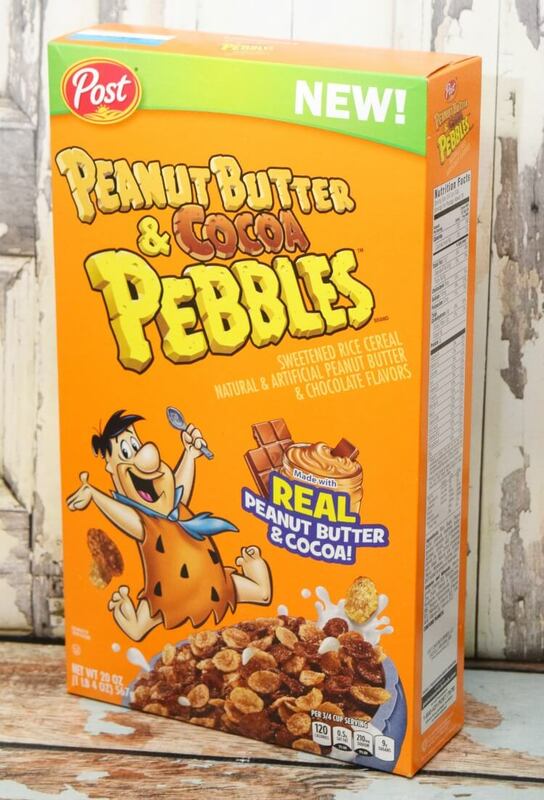 We love Cocoa Pebbles, but haven’t tried the Peanut Butter Pebbles. Definitely want to try this idea out!